Valentine’s Day is almost here, and while I don’t buy into the pressure or commercialism of it all, I DO love to celebrate such holidays (or anything really, TBH) with food! In fact, Dan and I usually celebrate Valentine’s Day with food in some shape or form. It’s often our predominant focus, haha. Sure, we do cards and flowers and small gifts, but really, we don’t need to designate one day to show each other our love. So, we just use it as an excuse to do some fun fooding! Sometimes we go out to a special dinner, and sometimes we make dinner together at home. Sometimes we take it easy and just order a pizza. Seriously. I’ll take pizza any day. Romance isn’t dead, even when pizza is involved. I love making sweet treats around this time of year. The January doldrums are slowly passing, and most people are done with their Whole 30/new year cleanses by now, so today, we’re doing chocolate! We’re EMBRACING chocolate. 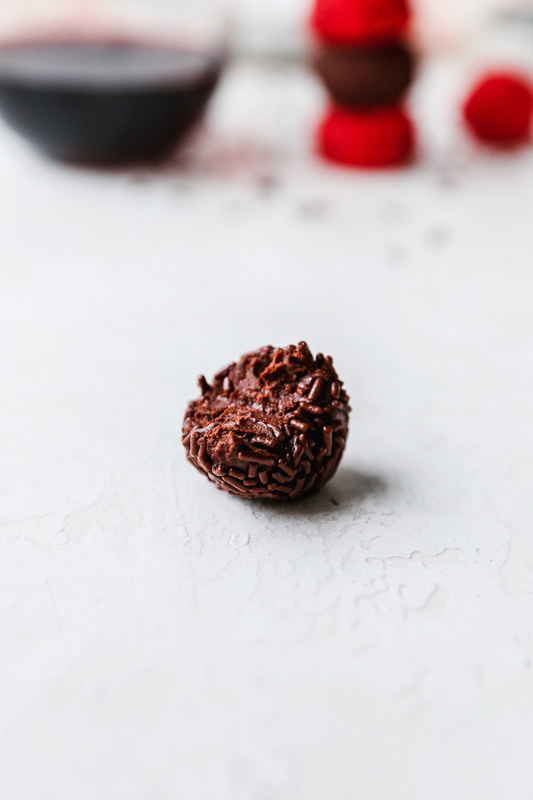 These dark chocolate truffles are super easy to make (probably easier than you think!) and made with minimal ingredients, but they pack a wallop of decadent flavor. I love how quickly you form the base. 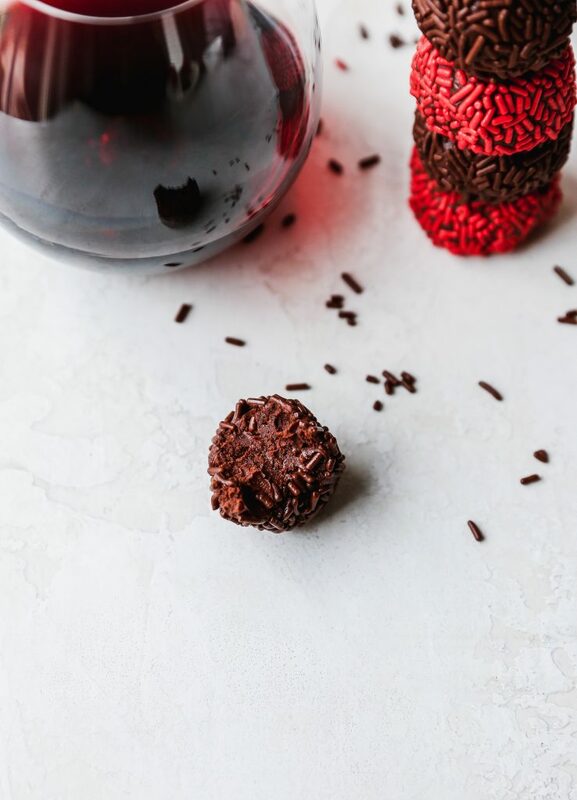 The hardest part is waiting for it to chill in the fridge before you form the truffles. But that really is the only difficult thing about this recipe. So if you don’t consider yourself a baker or treat maker, these are definitely for you! 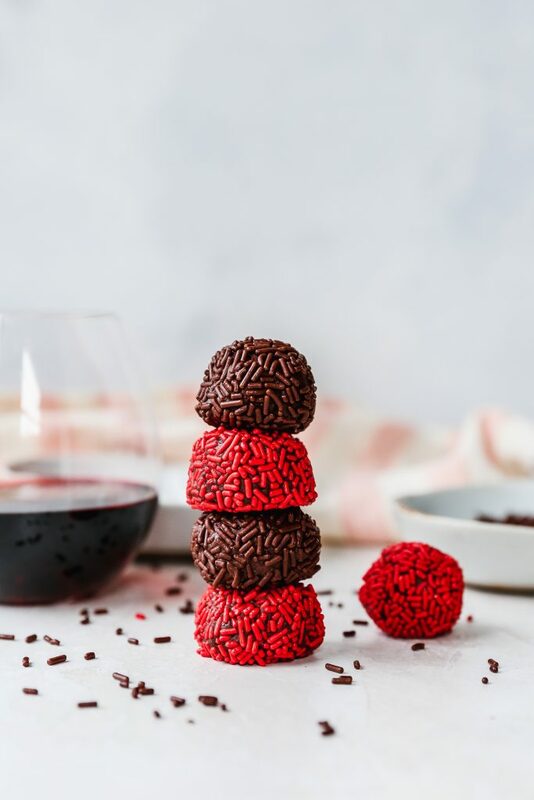 I infuse the chocolate with red wine and a touch of pomegranate juice (just for a little fruity punch), along with some espresso powder (which you don’t taste at all – it just makes chocolate taste more chocolatey) and vanilla. It’s all my favorite dessert ingredients in one tasty little bite. 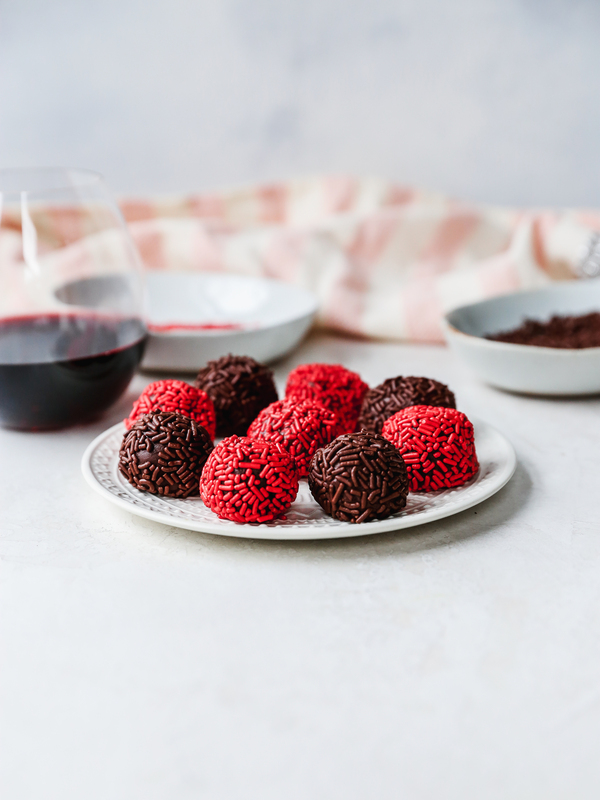 Once the red wine ganache chills to a solid state in the fridge, you simply scoop it out and roll it into balls. Easy peasy. These truffles are cute and festive, thanks to the sprinkles I roll them in. I just love the look they add! 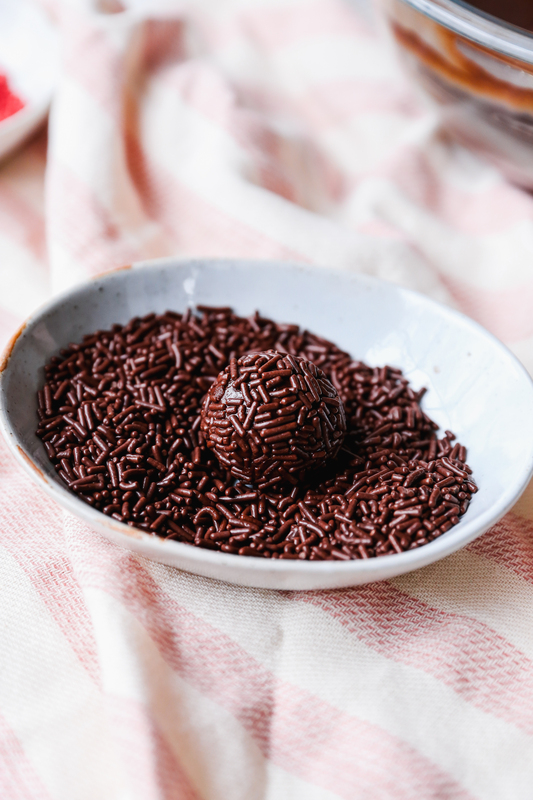 If you don’t have sprinkles, roll them in cocoa powder! It will just make them even more chocolatey. 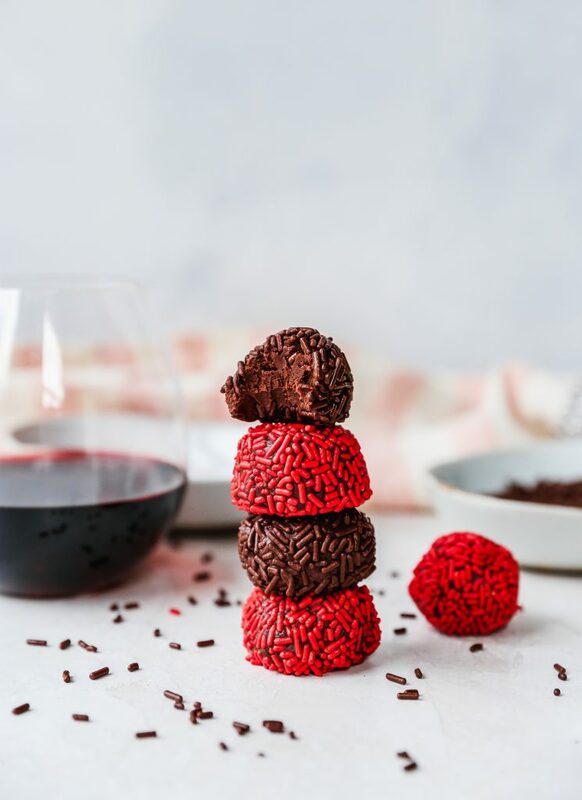 The sprinkles add a little extra textural crunch, which if you’ve read this blog for any stretch of time, is a huge wine for me. I am a texture freak. I tested these out a couple weeks ago and just stored the leftovers in the fridge. Sure enough, they slowly started to disappear. And then they started to disappear at a faster rate. Dan had discovered them and it was safe to say he was a huge fan. Before I knew it, the entire batch of truffles was gone! My sweetheart has a big sweet tooth? It works out well. 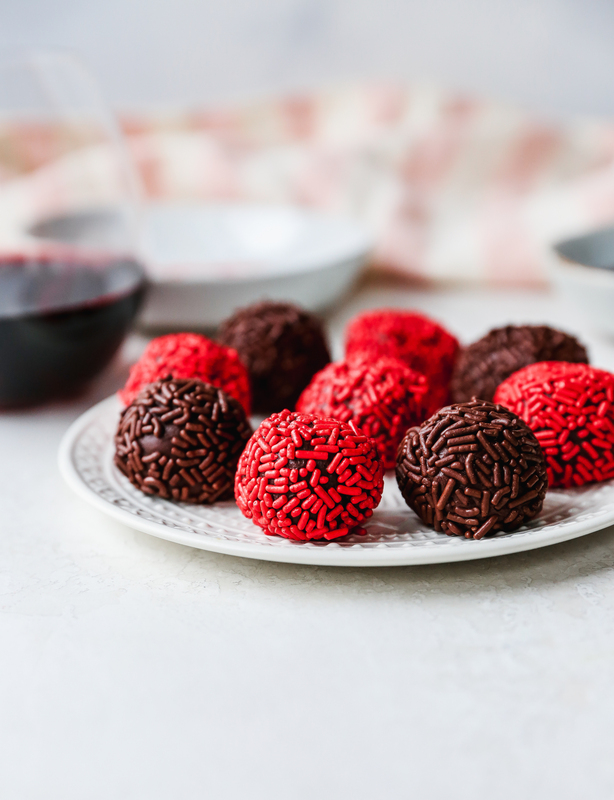 I have a couple more Valentines-inspired treats coming your way, and one of them features the wine and chocolate combo again. All are super simple and happen to be no bake, so stay tuned, friends! Combine the heavy cream, red wine, and pomegranate juice in a small saucepan and place over medium heat. Add in the salt and espresso powder and stir to combine. Meanwhile, chop the chocolate and place it in a large heat-safe bowl. Heat the cream mixture, stirring frequently, until it is just starting to bubble around the edges without letting it come to a boil. Pour the hot cream over the chocolate and allow the mixture to sit for a few minutes. Then, gently and slowly stir to combine. Keep stirring until the mixture is smooth and creamy. Whisk in the vanilla bean paste until well incorporated. Cover the bowl with plastic wrap and place in the fridge to set for at least 2 hours (you can store this mixture in the fridge for a couple days, if needed). Remove the bowl from the fridge and allow it to sit at room temperature for about 10 minutes. When you’re ready to form the truffles, pour the sprinkles and/or cocoa powder into shallow bowls. 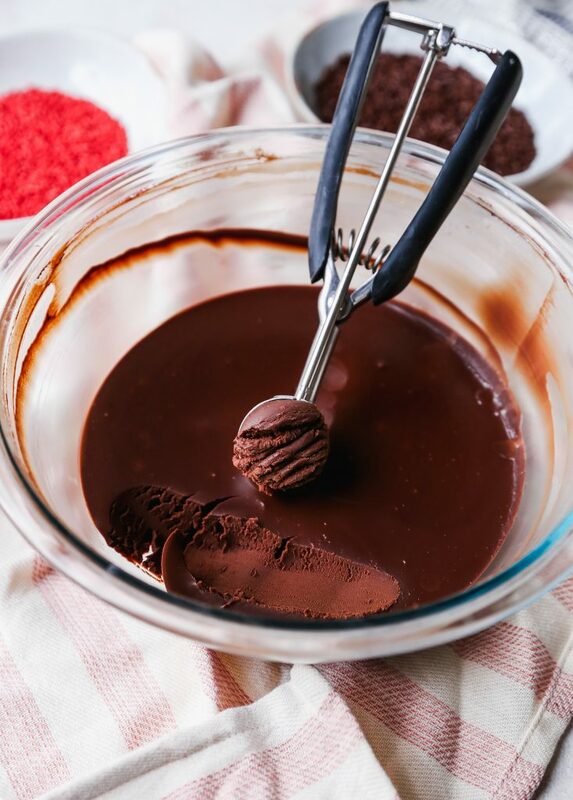 Using a cookie scoop, scoop out balls of chocolate. You can make them as a big or small as you like. Roll them in your hands to form smooth balls. Roll each truffle in your coating of choice and place on a parchment-lined baking sheet. Enjoy immediately or place the baking sheet into the fridge to chill. Enjoy chilled or at room temperature. 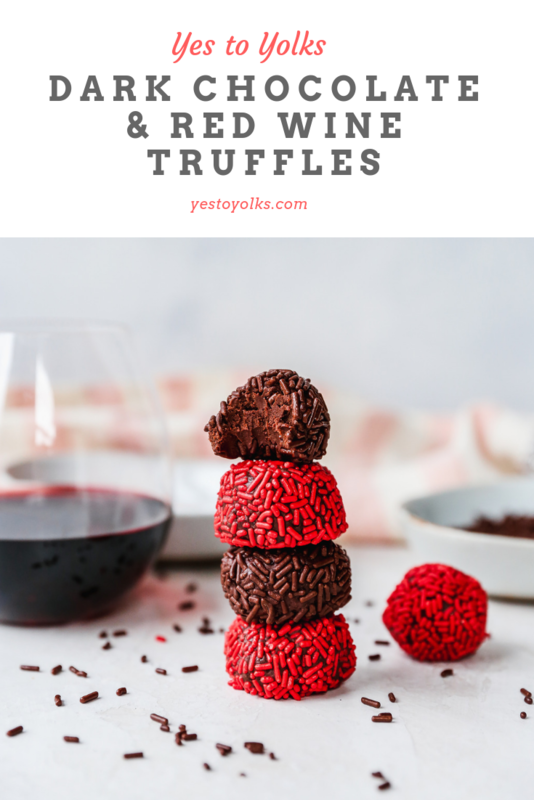 Store any leftover truffles in an airtight container in the fridge.